Masters 2016: Adam Scott in the running for second title? 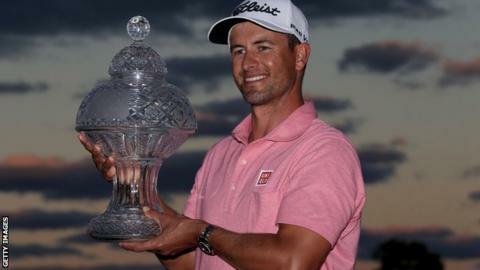 Adam Scott's impressive victory to kick off the Florida swing on the PGA Tour suggests the year will be about much more than the 'big three' touted to dominate 2016. As Rory McIlroy missed the cut, Jordan Spieth licked his wounds following an early exit the previous week and Jason Day readied himself for a return to action, former Masters champion Scott returned to the world's top 10. Given Spieth and Day won three of last year's four majors and McIlroy, at 26, already has four to his name, it was expected that trio would set the agenda. But the classy Scott provided more evidence of the depth of quality at the top of the game with a magnificent win at the Honda Classic. It showed he remains a contender, despite this year's rule changes on putting techniques. The Australian triumphed at Augusta in 2013 wielding a broomhandle putter anchored to his sternum to provide a reliable putting pendulum. This method is now outlawed and he is back with the short stick. Many feared this could spell the end for a man who has probably the finest swing in the game. At PGA National last week, Scott emphatically proved that is not the case. Scott played down the impact of the rule change on his putting. "I don't think it's going to be that big a deal for me," he said. "It's some hard work and I'm not afraid of that. I'm glad it's going in the right direction, and I've putted pretty solid the last couple weeks, and I want to make sure that keeps going." And as for the younger generation at the game's summit - the 35-year-old from Adelaide believes he is ready to take them on. "I've played really well the last couple of weeks," he said. "And a couple of those guys who were so outstanding last summer haven't played that great. You feel like the gap is really not that big at all." Now the season hots up further. Augusta - and the first major of the year - is a little over a month away and it is time for the big three to start to make positive moves. This week brings the year's first World Golf Championships event - the Cadillac Championship at Doral. This is a tournament that carries considerable prestige, sitting just one rung below the four majors that define the game. McIlroy was a lacklustre figure in carding two rounds of 72 in breezy conditions at the Honda Classic, blaming mental errors. As he walks through the entrance at Doral he will be reminded of further frustration in the form on an infamous memento from his visit 12 months ago. Mounted there, he will see the three iron he flung into the water on the Blue Monster's eighth hole. Course owner Donald Trump instructed a scuba diver to retrieve the club and assembled the cameras to capture the moment he returned it to the Northern Irishman. Trump is expected to seek further photo opportunities to boost his presidential election campaign when he visits the course on Sunday. No doubt he will seek to hog the limelight, and it is up to the world's best to make sure he does not detract from the golf. It is time for the big names to follow in the spikemarks of the likes of Scott, Bubba Watson, Hideki Matsuyama, Brandt Snedeker and Louis Oosthuizen, who have all recorded impressive victories in recent weeks. McIlroy has only flickered this year, with his third-place finish at Abu Dhabi in January the highlight. His decision to play a fuller schedule before the Masters looks prudent because he has plenty of opportunity to find his game. But the clock is ticking. He has only Doral and Bay Hill as strokeplay events before the Masters, as well as his defence of the WGC Matchplay, which guarantees three rounds of head-to-head combat. World number one Spieth began the season with a brilliant win in Hawaii, a strong showing in the Middle East and a runner-up finish in Singapore. But his global travels took a toll and, fatigued, he failed to post a top-20 finish in either of his events after returning to the PGA Tour. The revamped Blue Monster suits the big hitters. Dustin Johnson is defending champion, and Spieth could only manage 17th last year. Refreshed by a week off, the Masters and US Open champion will be keen to contend this time. Day's form is the hardest of the big three to gauge. This is only his fourth outing since the Tour Championship in September. Having replaced Scott as the pre-eminent Australian with his stellar performances in 2015, Day will be keen to respond to his friend and compatriot's success last Sunday. Doral should suit Day's big hitting, but he may be feeling his way in a tournament that signals the real start of his Augusta preparations. This is an event that brings together the top players, and the prospect of next month's Masters looms larger in the back of all their minds. Already we know the list of potential winners runs deeper than just the big three. As Scott said: "The standard of play through the field is higher now. I think there is a long every list of guys teeing it up each week who on their week can win a tournament." Will golf begin at 40 again for Tiger Woods?